It is your 2014 favorite novelty! Suffice to say that this first test of the BMW R Nine T was awaited on the test station, including the editorial and for a first time, we have not disappointed, by a character which we were far from imagining every facet. First sequence emotion. 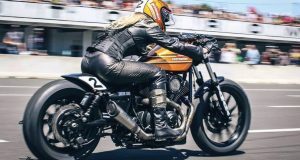 Back from a bus loop on the Marbella heights, her long well coated curves, its regular curves, its small roads weaving through reflections on a hillside, jostling under the helmet. 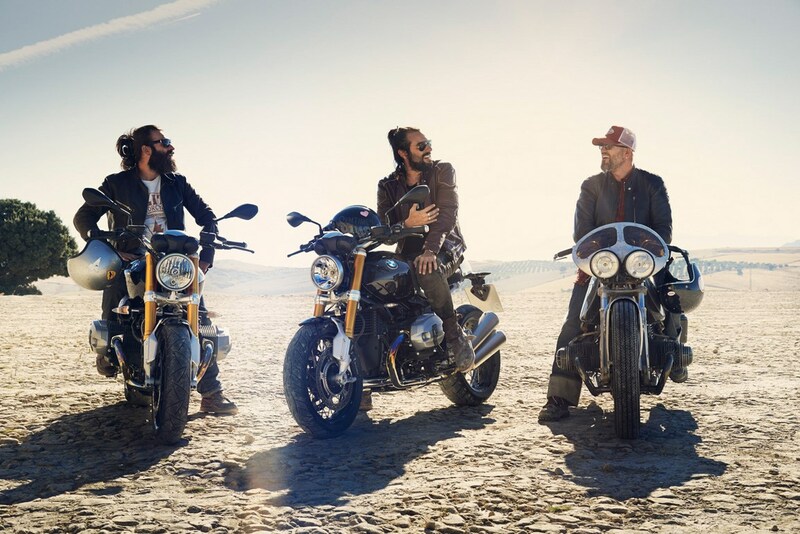 For this first presentation of the BMW R Nine T, it is mostly the quadric and agers who had returned their form of presence to the organization. 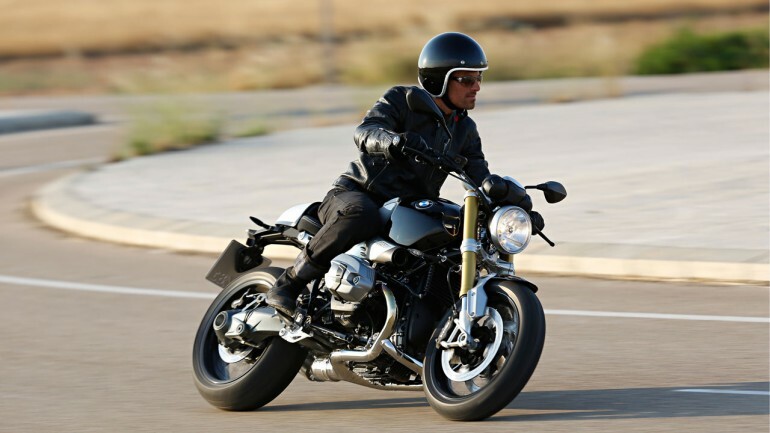 Experienced pros, who had already tried everything or almost, and that neat plastic and a technology apparently stripped of the R NineT spoke particularly. 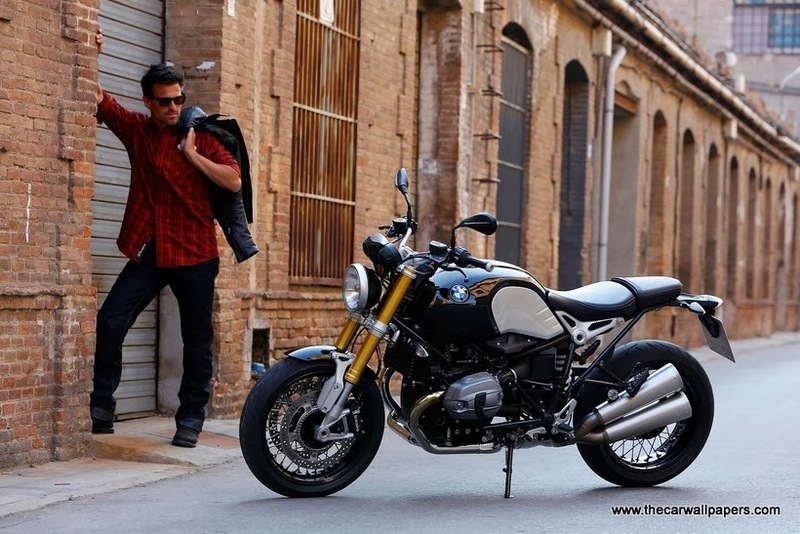 Revive the simplicity of riding, snout to the wind, fly without artifice or too much of electronic, but spit on a certain standard or same large good feeling, this is what promises the R 1200 Nine T and also the ability to customize its machine, according to his tastes and needs with a selection of parts and accessories “at the German”, say handpicked, cared for and priced. However, behind the inevitable marketing arguments, what I remember at the moment remains the big foot just to experience its handlebar. It sounds like a BMW, through year 2014. However, the image, I would not bet blindly on the R Nine T. Including his encumber, flat and little thick, its flat twin of older generation faced self-centred pollution standards, or even its classic fork in place of the Telelever system making reference on the GS and RT for example. 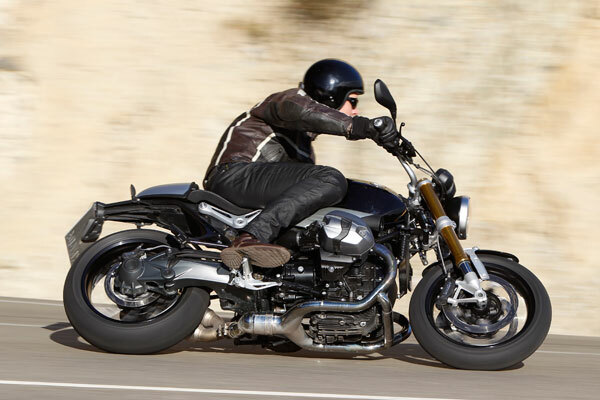 However, once on board, I forget little by little my reluctance and at the outset, the ergonomics of the BMW R Nine T proves natural, the seat ultimately well designed, does not “cutting” the thighs on the edges and welcoming your buttocks without extreme softness or hardness. Remains to capture the wide handlebars, very fast acquaintance with the handlebar control Kit amazingly to start the starter. Ohhhhh! Wow! It sounds, per ton it even. Double muffler Akrapovic serially guaranteed pure titanium wakes the neighbors, any of them as much as it charm mechanical music lovers. Forget the noise of usual 2CV of the flat German twins, R Nine T is already a sound, dry, deep, which backfire almost to the deceleration. A BMW from year 2014, what. 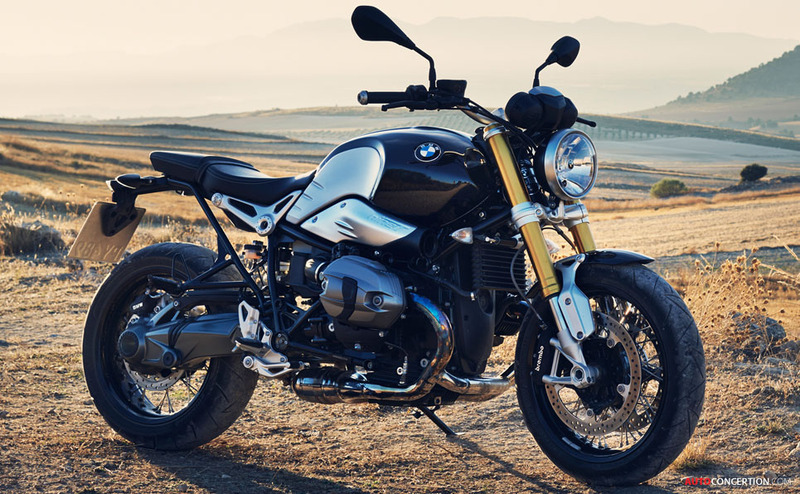 The seat height will go well with a good number with my 1.78 m I put the feet on the ground without concern on board BMW R NineT, legs well bent. Certainly once gone, the foot a bit too high but not too remote oblige me to bend your knees more as desired, while the thighs is snug against electroplate brushed sides of the reservoir in aloe. Meanwhile, the handlebar is bust very naturally, weigh on the wrists, for less clear on a cockpit views at odds with the usual references of the mark. Here, must be lowered look more than customary to “embrace” dash of R Nine T, with its two small dials round and well balanced on part and either a discrete window LCD for the usual info. In short, even for who knows not the brand, the new German roadster poses no hassle getting started, almost instinctive. Therefore, the attention can totally refer on the character of the gear, missing, precisely. The BMW judgment, what judgment? At start the first meters, flat plays his score. Variably, highly flexible even for a twin, that one to stroll at low speed to slightly more than 1000 RPM on the above reports, hassle free. Between cars, to avoid giving too much blows gas out of politeness, while fun look curious, even envious of drivers. 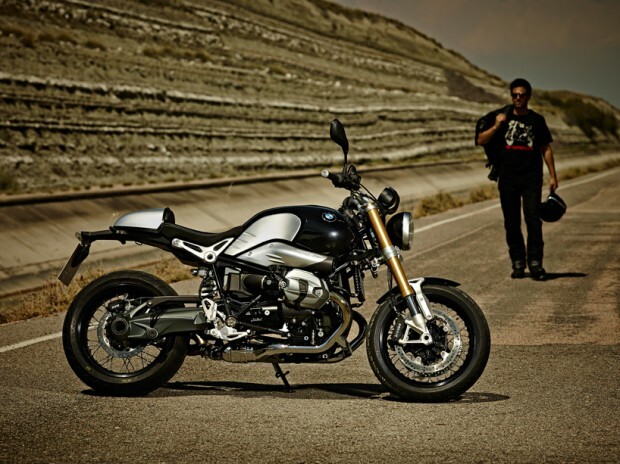 The BMW Nine T definitely does not pass unnoticed. Then, stopped at the red light, each is taken to the game. The gas blows were approaching is engaged first. 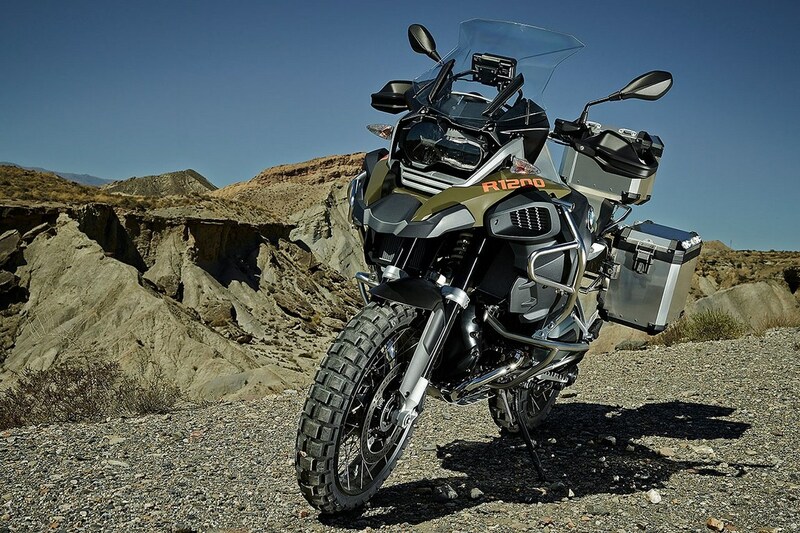 Suddenly, our testers commando soars in a worthy of a war fighter wing ROAR, Whoa, it grows a Nine T. Picking up the motor base of the R 1200 GS 2012, the flat has been reworked side primary transmission and reports from box to optimize acceleration. And it’s immediately noticeable on the first attempt, the R Nine T scoot as a feline and reports will follow with sweetness. 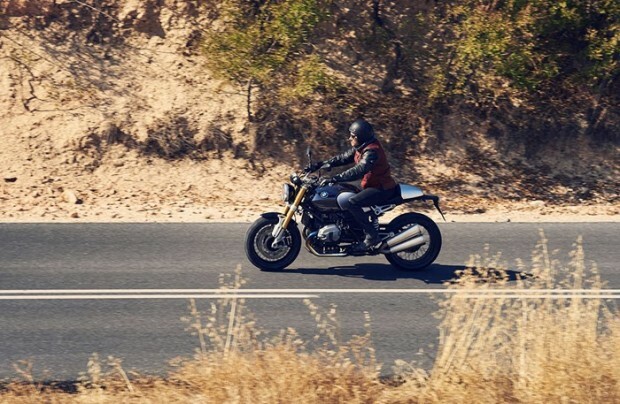 Nevertheless, our little group of journalists invited to the first test of the BMW R NineT quiet game on avenues before going off to the reliefs of the back country, far from the traffic. Over the miles, it is also the comfort offered by the Nine T that seduces. Hitherto non-adjustable front fork joins the adjustable damper – him – to provide a viable compromise. At 130 kilometer per hour, the “Adams” booming 4 500 RPM, the landscape scrolls on the long expressways, the pressure of wind on the bust is not yet a problem, the apparatus holds its course without batting an eyelid. Then, first turns all kinds’ successions indicate upcoming ascents. By itself, the pace of our merry troupe revving. 3 500 RPM, a first peak of torque reinforces the thrust of the flat. The needle devours the graduations, instinctively forward looking to take more and more angle, without forcing his aptitude. In addition to the rigidity of its sturdy steel mesh frame, it is also the agility of the Nine T, making it a formidable apparatus winding trajectories. No need to force on board, a simple pressure on the shell or on the branch of the handlebar is enough to throw it on the corner, the Conti RoadAttack2 providing an excellent grip on changing surfaces of the road, sometimes wet, dry, smooth of Spanish South. Delayed, on the 4th or 5th report, the engine of the R Nine T digests breaks pace from the low to high revs in a same breath with this always also welcome facility. 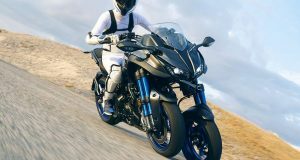 After 5 500 RPM, it lengthens with force up to almost 8000 RPM while it actually starts to tighten the tank between the thighs and back in the saddle to counter the force of the wind. On bitumen, full angle or straight connections, the shock felt at the level of the wrists but Nine T keeps its course without even seeking its Steering damper. 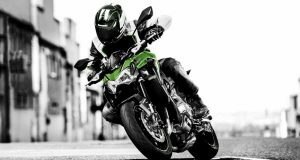 In short, it’s fun on board without too much shaking, calmly under the power reasonable engine, but most brutal front brake. The calipers inherited from the S 1000 RR need to pull the lever gently to promptly stop you while their rear counterpart is more discreet. 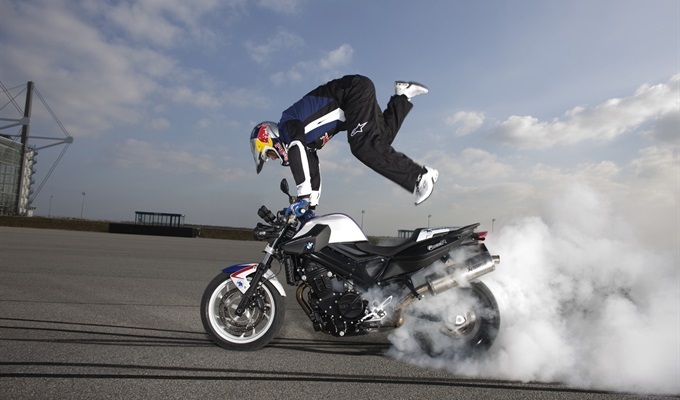 So far, over this too short test, the bike not long before print you its rhythm to it, preferring a pilot age wrapped a frenzied operation of the gearbox, in a natural posture and a good level of comfort. What more? Our readers do not deceive When you elected the “ninette” best novelty 2014 at the end of the Milan exhibition on our website, no doubt many of you have been affected by this new definition of the top roadster range according to BMW, mixing a retro aesthetic, or even custom, to modern technology and at the end of this too short day of test, we can that abound in your direction, so this idea of the bike also convinced us, beyond a shadow of a doubt. Artistic and mechanical characteristics, behavior, ergonomics, comfort, the BMW R Nine T manages a nearly flawlessly to taste. Almost because, besides its too wide turning radius or even its wheels classic (tangential rays would have allowed mount tires tubeless, safer in the event of flat tire), is above all its price which appears to us objectively too high, taking into account the equipment of this bike engine older generation, basic equipment, not Telelever and compared for example to the roadster S1000R otherwise more demonstrator on these points and $ 2920 US Dollar, cheaper. 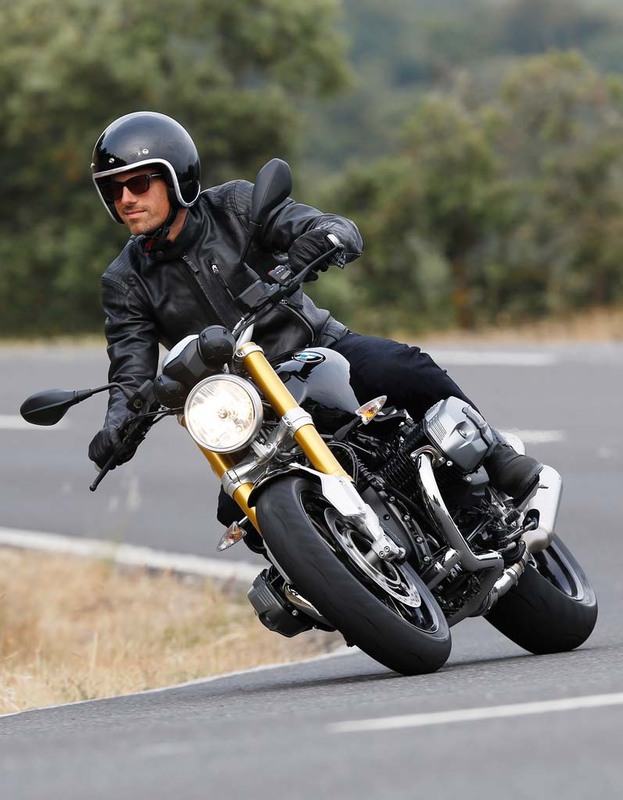 However, given his obvious qualities, it seems that the $ 20856 requested for the BMW R NineT will not constitute a brake for fans, provided that they hurry. Not more than 800 BMW R Nine T are intended for the 8,000 worldwide, France on two receipts in year 2014 which 300 would be already ordered. 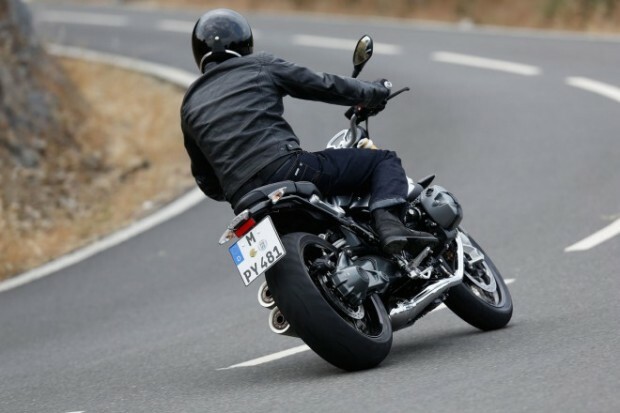 I hope you got some thing new about BMW R Nine T test review, pictures and photos 2014, lets me now Please post your comments below.